Having bootstrapped all my business ventures to date, I lately had a curiosity to find out exactly how startup funding works. Luckily, I found this great infographic which really made the whole concept very easy to understand. 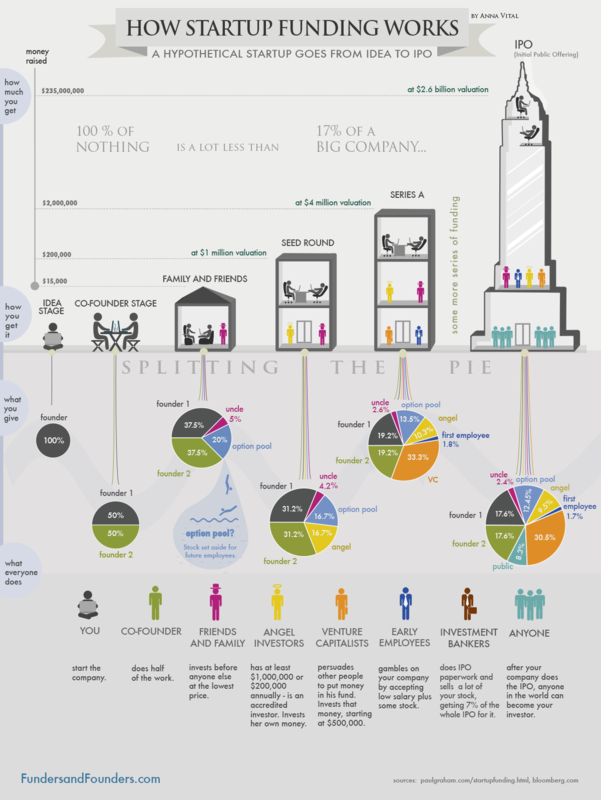 I’m considering getting some funding for a particular idea I have, and this infographic helped me see the big picture. Many people say that all it takes to commercialize an idea (i.e. online startup based on some cool algo) is just a laptop and ridiculous amounts of coffee/time (using open source productivity/dev tools). However I tend to disagree, since to stand out you need to invest in resources that will make your idea visible, usable, interesting and appealing. UX specialists, UI designers, a scalable infrastructure and a marketing specialist are just a few of the expenses one needs to incur before the idea starts spreading across the net. But let’s track back a bit and go back to basics (dorm-room-startup-type-of-situation): in order to make your site feel secure and legit – trust – (irrespective of whether you actually need that level of security) you generally need to setup an SSL certificate… and unless you go for the dodgy ones, it is not so cheap, but oh well, no one really cares). But this will generally require a dedicated IP for technical reasons, and that will take you shopping around for VPS/Cloud hosting options (you don’t want your cool idea to run on some Gone Daddy’s shared hosting server, with a 1000 other site selling fake perfumes taking up all the resources, do you?). Suddenly you’ll find yourself dishing out EUR100 a month for a decent pre-launch setup, and yet, no-one knows about you and your idea. We haven’t even started on legal stuff and scale. Obviously one cannot generalize on this, and it highly depends on the business processes involved (it’s one thing serving up funny images – thus a good CDN setup – and another having to process/serve thousands of transactions a minute (say, having scripts running on various threads scraping data from thousands of sites to present something interesting and useful back to the user). Furthermore, going back to the no-funding-is-better argument, there is this perception that a good idea will go viral immediately. Wrong. These ‘cool’ startups get viral after a couple of fund raising stunts, and that’s when the big media starts getting an interest in them, and giving them free viral adverts (that fizzles out immediately – check out digg trending stats). Finally there is this dilemma with setting up an online venture: would investors fee safer investing in a startup that has tangible assets/income (e.g. pay per use, or some fantastic IP) rather than in risky advert-driven free services? This takes me back to a .Net Mag article right after the acquisition of Instagram. The gist is this: successful “free” services are an exception, and startup-enthusiasts should mainly focus on assets (users/data), IP, a good/fair pricing-structure – i.e. cashflow. This model should be placed back as the norm, and free service exceptions should be treated as they are: exceptions. Hey Chris, thanks for sharing your thoughts. I probably was a bit clumsy with my statement, it’s more that I prefer bootstrapping myself rather than not believing in funding. Funding works, what I don’t fancy is the tendency from some quarters to focus more on building business plans, obtaining grants and funding, when they could have jumped in and built a real product with a little bit of faith. On the other hand, I like meeting people like yourself so I can challenge my own convictions 🙂 So yes, after we met I did think a bit deeper about funding and whether it could be an option for some of the ideas that have been floating around in my head. Not all ideas are equal, some require little more than your own time to come up with something that can actually sell and turn a profit from day one, others require more marketing/legal/workforce effort to get going, plus time to become profitable. Lets keep the conversation going, see how useful a co-working/collaborative environment can be 🙂 An impromptu discussion between two guys can easily lead them to further thoughts and improved business acumen and ideas. I look forward to making such an environment a reality in Malta, through MIC and other places as we discussed. Hopefully we can keep this going over a cup of coffee sometime during summer. I think we both agree, that it takes two to tango: sitting down with a cup of coffee and hacking-up (build?) your own idea adds a new dimension to a project (funded or not), ownership – leading to fulfillment. The second element is funding, but not before you’ve actually given birth to the project itself (be it a low-fi prototype or some form of working prototype – which would survive until the code-base is re-vamped).